This Property is 100 Pct. Non-Smoking Welcome to the Embassy Suites Orlando - International Drive/Jamaican Court hotel. 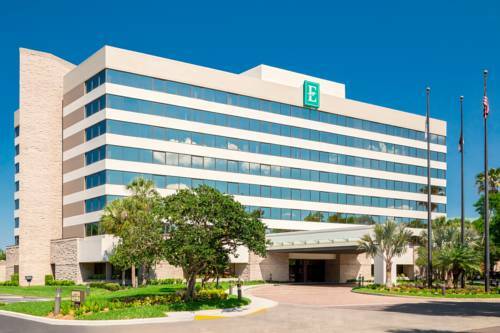 Our full-service all-suite hotel is located less than one mile from the Orlando Orange County Convention Center and less than nine miles from the Orlando International Airport. Our hotel is conveniently located to all of Central Florida*s major attractions such as Universal Studios/Islands of Adventure/City Walk Sea World of Florida Wet *n Wild Water Park Walt Disney Resorts/Magic Kingdom/EPCOT and Animal Kingdom Kennedy Space Center Busch Gardens Tampa Mall at Millenia Pointe Orlando and Port Canaveral and Cocoa Beach. Our hotel offers complimentary transportation daily to Universal Studios Islands of Adventure City Walk Sea World and Wet *n Wild. Click here to order your tickets for Universal Studios or Islands of Adventure and avoid the lines. Orlando Florida is considered one of the world*s top golf destinations offering more than 70 top-notch courses for the traveling golfer. A majority of these courses are within a five mile radius of the hotel and include such courses as Bay Hill Panther Lake Orange County National Mystic Dunes and Crooked Cat all voted **Best Places to Play** by Golf Digest. Click here for our golf package selections. Each hotel suite features a separate bedroom with your choice of two double beds or one king bed. The living room area boasts a wet bar with microwave refrigerator coffee maker and pull-out sleeper sofa. The work table and swivel side chairs offer convenience and comfort when completing reports or simply enjoying some room service delights. Every suite offers two remote control color televisions with complimentary HBO and other cable channels iron and ironing board in-room safe hairdryer AM/FM radio alarm voicemail and great room service menu options. Complimentary wireless Internet connection is also available from every guest room and public room area. All reservations must be cancelled 72hrs prior to arrival host time unless deposit req. If this reservation has been made electronically please cancel it electronically to avoid confusion and a no-show bill. Policy subject to change. If a long day of meetings or touring the Orlando area has you in the mood to relax in the comfort of your room place an order from Room Service. This option is available 7 days a week and features a variety of breakfast lunch and dinner selections that will be delivered to your door quickly.